If you have a problem with over-growth of algae in your tropical marine aquarium, there are few better solutions than getting in a sea urchin or two. Although their delicate constitution makes it more important than ever to maintain good water conditions, sea urchins are otherwise easy to look after and they make great tank-cleaners. They're also very beautiful to look at. Sea urchins are invertebrate animals with soft bodies inside hard exoskeletons, or shells. Most also have spikes to defend them from predators ad a few also use poison, though they will only do so if attacked. 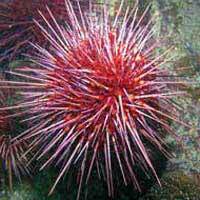 Sea urchins can move their spikes around, so be very careful when picking them up. Because of their small size, it's often easiest to lift them using a plastic kitchen ladle. Although they can sense the difference between light and dark, sea urchins navigate mostly by smell. They are slow moving but very active and will often carry things around the aquarium. Some species like to bury themselves in sand but most of those sold in the aquarium trade are happy with a variety of substrates. To stay healthy, sea urchins need very clean water with stable pH and salinity. Never use copper-based medication in an aquarium with sea urchins. If they are stressed by poor conditions, their spines will start to fall off. This can be a good warning system, letting you know if things are going wrong in your aquarium. If the problem is solved, the spines will usually re grow. Sea urchins should not be kept with aggressive predators like puffer fish, triggerfish and octopuses which share their habitats in the wild. This is because these predators will pull off their spines, break open their shells and eat them. You should also be wary of keeping them with very small predatory fish which may dart between their spines to attack them. Sea urchins have small pincer-tipped limbs which they can use to injure opportunists like this. Sea urchins are surprisingly strong and often knock things over when they move around, so unless you have a very sturdy aquarium set-up you should avoid keeping them with bottom-dwelling fish who risk getting injured or trapped. In general, though, they are peaceful creatures and fit in well in community aquariums. It's okay to keep a few together in one tank as long as you have enough algae and debris for them all to eat. Most sea urchins primarily eat algae, though a few don't, so if you're looking for a tank cleaner you should ask before you buy. They are all omnivores and it's good to give them meaty food from time to time, especially if they seem less active than usual. Small pieces of cooked fish, beef or lamb work well and will be quickly eaten. Sea urchins need plenty of calcium in order to maintain their shells. In a coral aquarium they will eat calciferous algae, but it's good to supplement their diet with cuttlefish bone. Some sea urchins will even eat the discarded shells of other invertebrates. Live rock is helpful in supplying microscopic organisms to improve sea urchin diet. If algae is in short supply, give your sea urchins dried seaweed to tide them over. Longspine Urchins - these urchins live up to their name with spectacular long spines that look delicate but are handy for defence. They're available in several colours, with the most popular being the black and banded varieties. Be careful, as they have a non-dangerous but nevertheless painful sting. Pencil Urchins - among the larger kinds of urchin, with some species growing to four inches (plus six inch spikes), these urchins will sometimes eat small fish and shrimp but are safe with larger fish. They vary in colour from mottled brown to bright red and have plump-looking spines. Globe Urchins - soft, round, velvety bodies in a range of vivid colours make these urchins aquarium favourites. They're natural loners and need plenty of hiding places to feel secure, and they are usually most active after lights-out. Pincushion Urchins - a nocturnal urchin favoured because of its small size, this species prefers to live alone and will sometimes eat smaller invertebrates. Keep it happy with live rock to graze on and sand to burrow in. One last word of warning: sea urchins are powerful eaters and can easily bite through your plastic aquarium tubing if the urge takes them! For safety, make sure to keep important tubes algae-free. Then you can relax and enjoy this fascinating new addition to your aquarium.